We have built long-term relationships with trusted suppliers, mills that we know and trust to keep our quality and yours consistently high. Our experienced graders ensure that every board leaving our yard is correctly graded and fit for use. Our state of the art kilns and experienced kiln operators dry our lumber thoroughly and carefully. Our lumber is available rough cut or surfaced to your specifications. We make all of our own moldings right here in our Shawano plant. We choose only the finest timber for our moldings. We have a wide selection of molding profiles to choose from in any species from ash to walnut. Our unfinished paneling is solid wood, 3/4" thick, and comes tongue and grooved on two sides. Pre-packaged bundles consist of random lengths from sixteen inches to twelve feet and a mixture of 2", 3", 4", and 5" face coverage widths. The rustic paneling will contain tight knots and numerous character marks. The select paneling will be clear of knots and most other marks. To the right are images of our different types of paneling. The color or shade may be slightly different than the actual product. We recommend visiting our showroom before ordering. For more information including pricing, click to download our Finished Product Guide. 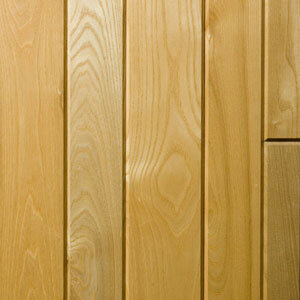 Save time and money by ordering your paneling pre-finished. All of our tongue and groove paneling is now available pre-finished using Sherwin Williams Hi-Bild Pre-Cat lacquer. This is a clear satin finish specially formulated for a durable non-yellowing finish. All pre-finishing includes two coats on the front side and one coat on the back. 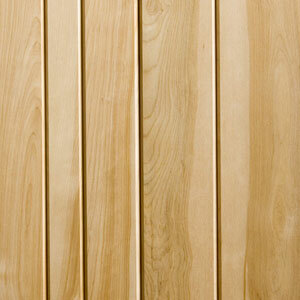 We normally stock only our knotty pine pre-finished paneling. Please call for stock availability of this and other items. Please allow three weeks lead time for non-stock pre-finished products. The minimum quantity for pre-finishing is 200 square feet. Please measure the area you need to cover carefully – we are unable to accept returns of pre-finished products. Shawano Wood Products provides weekly delivery service to cabinet shops, custom furniture builders and millwork manufacturers in a large portion of Wisconsin. We provide weekly delivery service to cabinet shops, custom furniture builders and millwork manufacturers in a large portion of Wisconsin as shown on the map to the left. We also provide all of our lumber items at the retail level. Our "hobby room" contains many of our species and thicknesses already surfaced and ripped one edge. Customers can select the specific boards that best suit their needs. Small amounts are also available rough sawn, if that is preferred.